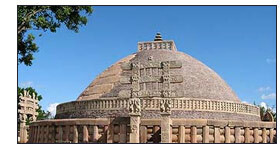 After Breakfast Sightseeing of Sanchi visit Sanchi Stupa- It is unique, not only for having the most perfect and well preserved stupas, but also for offering the visitor a chance to see, in one location, the genesis, flowering, and decay of Buddhist art and architecture during a period of about 1500 years -- almost covering the entire range of Indian Buddhism. Visit to witness the incomparable Taj Mahal with its speculative view. Taj Mahal, the architectural modern day wonder of the world; this monument is a fine example of the fusion of many architectural styles is one of the wonders of the modern world. Taj, endowed it with some of the loveliest buildings in the world. The tour continues with a visit to the Agra Fort from where one can get the most moving view of the Taj from the little octagonal tower in the Agra Fort, which lies, across the river Jamuna. Overnight stay at the Hotel. 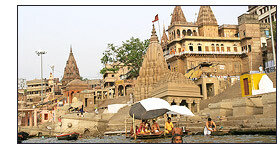 Early morning boat ride on river Ganges to see the beautiful sunrise at Ganges. After breakfast excursion to Sarnath, the principle center of Buddhism. It was here around 530 B.C that Buddha preached his 1st sermon after gaining enlightenment.